Terrestrial, over-the-air broadcasted radio died for me about a year and a half ago but that doesn’t mean I’ve given up on radio as a medium. Instead, I’ve migrated my listening habits over to music curated by taste1 rather than balance sheets and to podcasts, or as others have referred to it, time-shifted talk radio. Portable audio, a fast-changing medium over the last 30 years now approaches its golden age as near-limitless access to music and talk radio in ever-diminutive pocket computers proliferates throughout the developed world. 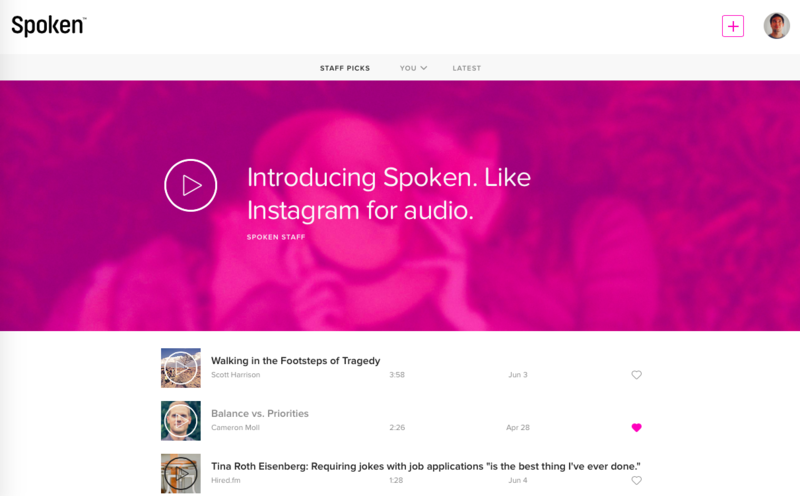 Now enters Spoken.co, the self-described Instagram for audio. Intended to be consumed in short bursts, Spoken.co presents an opportunity to quip and to be heard, but please keep your quip to four minutes or less. The Instagram comparison is more glamorous, but Spoken.co smells more like a tweet in a bloggy blog world, giving talk audio the 140 character or less treatment. Already, we have gems like introspection from Benjamin Brooks, Shawn Blanc taking us back to his independence day, great insight on priorities from Cameron Moll, and poetry from the always delightful Patrick Rhone. Video might have killed the radio star, but audio is alive and well. Long live the spoken word.